I noticed that different games display different things in the overscan area. I understand this was never intended to be seen. However, I would still like a technical explanation. Was this useful to developers somehow? Here is screenshot from that video. Just one example of different things that could be in the overscan area. Short answer: No. At least not for display purposes. The pixels shown are artefacts when the VDP is operation in modes with more than 224 lines (NTSC). These lines were usually not displayed on real TV boxes. Nonetheless, the VDP did generate the lines from whatever tiles it did find at the proper locations. Depending on the game they where uninitialized, contained previous data or where used to store some game data. Some games even did carefully fill these locations with some background colour or an extension of the playfield. The color RAM in the Genesis video chip is single ported such that at any given time the color RAM data bus either contains the data being read out of it for display purposes, or the data being written into the RAM by the CPU or by DMA. Outside of the active display area the overscan color can be defined by software. 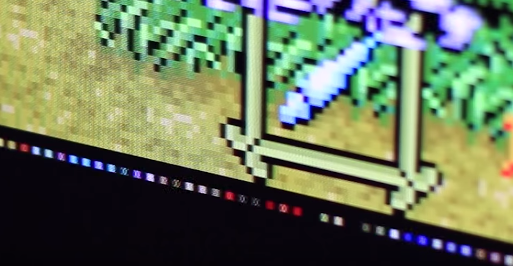 The video chip shows this color for each pixel in the display by continuously addressing and reading out the color RAM data at that address. Most games set the backdrop color to black, as in your picture. Typically software will use DMA to load transfer palette data from system memory to color RAM during the vertical blanking period which starts right after the last line of the active display area ends. The exact point where DMA starts depends on the software, usually there is some housekeeping and setup to do. Due to the single-ported nature of the color RAM the video hardware will attempt to show the overscan color during that time but will be interrupted every other pixel by DMA writes. This causes the video distortion you pointed out. The color data you are seeing is the new palette data for the next frame being written into color RAM over a short period of time. It isn't useful for the developers, it's just a limitation of the hardware. This also manifests in games that do mid-frame color RAM changes such as the water levels in the Sonic games. You will see stationary dots of a solid color that flicker a bit and move up and down with the water level. Those dots come from the CPU writing in new color data and the single-ported RAM being unable to show the normally visible color at that location because the write has priority. As dual port RAM is expensive there isn't a good solution for this. The TurboGrafx 16/PC Engine has a work-around where the last valid color shown prior to a color RAM write is latched and continuously output until the write finishes. This works well in the overscan area and isn't too bad for mid-frame writes as the pixel affected during a write will be a copy of its neighbor. Developers did occasionally use the overscan color as a profiling/debugging tool. By setting the overscan to a different color at the start of each major section of the game loop code, it was possible to see what proportion of a frame period was taken by different sections of game logic. You could also see how much time margin you had at different points in the game. If there was a crash, the overscan color would hint at which major section of the code was running at the time of the crash — ordinarily a developer running under a debugger would have much more information at hand, but a tester running a cartridge build might not. Not the answer you're looking for? Browse other questions tagged programming video gaming sega-genesis television or ask your own question.